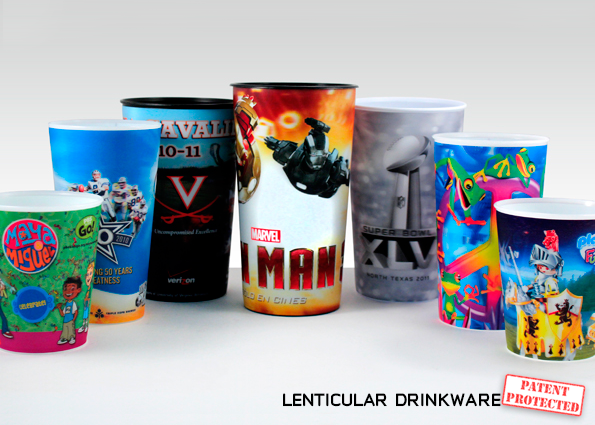 Virtual Images offers vibrant, durable drinkware in a range of sizes (12, 22 & 32 oz), featuring lenticular, protected ink, and other specialty in-mold labels. Using our patented process and protective ink, the graphics on your drinkware are built to last. 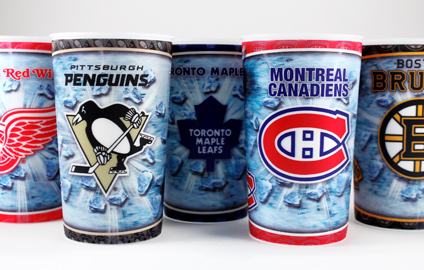 The durable cup wall is constructed to be dishwasher and child safe, making for a memorable, lasting and safe collectible for your brand. When creating art for lenticular drinkware or lenticular labels, there are several things to keep in mind. The templates below are Adobe Illustrator and/or Photoshop files and can only be opened with the same software. They are in RGB mode in order that they can be small enough to be placed on this website. Please convert to CMYK mode once you've downloaded a template so that your cup is built & colored correctly for printing. If you do not have Illustrator or Photoshop installed on your computer, please contact us with questions. By following these templates and guidelines, you ensure an end product that engages your customer and drives brand recognition. Good marketing brings people back again and again. Adding lenticular to your marketing campaign is the smart choice for increasing brand retention and encourages consumers to collect them all!